Core generic game mechanics, including 4 custom settings to try out - mediaeval eastern lands, outer space, mecha and time travel. Publisher's blurb: "Worlds of imagination and adventure await you! With True20 Adventure Roleplaying you embark on journeys of the imagination, with heroes and stories you and your friends create. This book tells you everything you need to know to play an exciting adventure roleplaying game: how to create your own heroes, how to handle action and conflict, how to narrate adventures, and how to keep it all fair and fun. 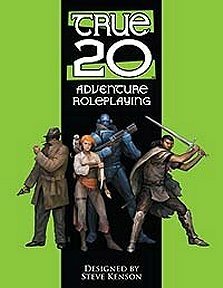 "True20 simplifies and streamlines the adventure roleplaying experience: everything is resolved using the same core system and all you need is a single 20-sided die to play! There's no bookkeeping of points, whether hit points, power points, or experience points. Game play is fast and furious thanks to innovations like the Toughness save damage system, based on the award-winning Mutants & Masterminds RPG. You can use True20 to model nearly any genre, from fantasy and historical to modern and scifi."